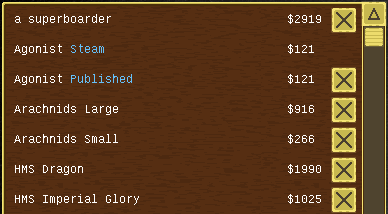 Publishing your construction on the Steam workshop is going to be pretty simple in dev8. I am happy to report that I have now implemented the ability to publish ships and other constructions through the Steam workshop. This will become generally available in dev 8 along with the new modding system. 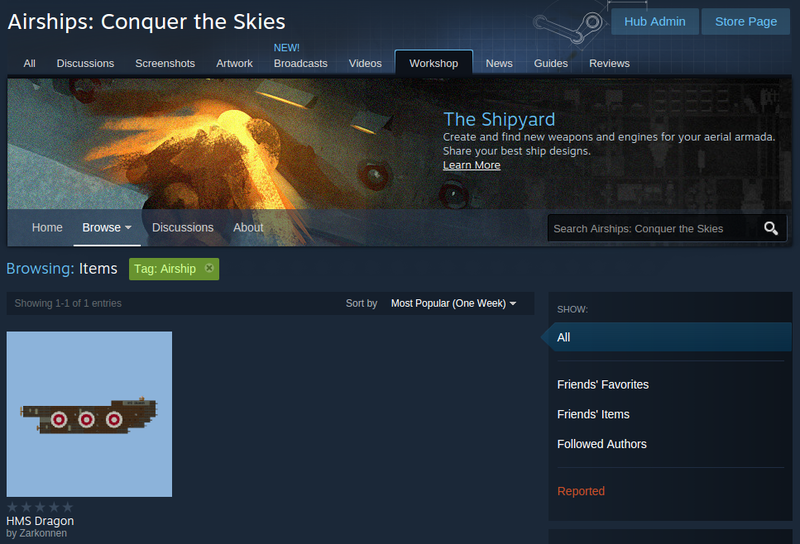 I’ve tried making the process of publishing (the “shipyard”) as simple as possible: Select a ship (or building/landship) in the file dialog and click on “Publish to Steam”. The game will prompt you for a short description and then upload and publish your work. Published ships are marked with a “Published” after their name. If you change your local copy of the ship, you can choose to upload the new version as an update. 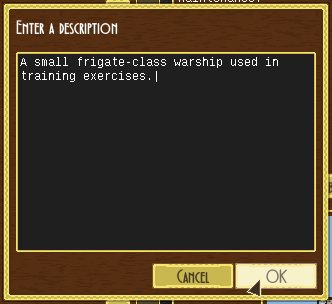 The game assumes that ship names are constant: if you create and publish an HMS Fruitbat, and later create an entirely different HMS Fruitbat, it will be listed as already published. If you want to replace your local copy with the one you published, you can use the “Sync from Steam” button. And if there are any published items you don’t have local copies of, you can use the “Download published items” button to get them back. So how do you get other people’s published ships? Subscribe to them in the Steam workshop and the game will download them the next time it starts up. 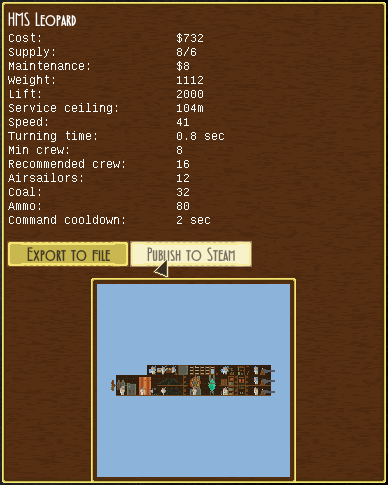 Ships from Steam are labelled as such, and stored separately, so they won’t overwrite your own ships of the same name. You also can’t delete them through the game interface. If you want to get rid of them, just unsubscribe again. But wait, what if you’re not using Steam? Of course, you can still share ships, by using the new “Export to file” and “Import from file” buttons. Exporting will yield a small JSON file you can then email or upload to somewhere. JSON is text-based, so at worst you could probably just paste it into gist or pastebin. All of this publishing and subscribing and importing and exporting will also work with mods, but more on that another time. Publishing and subscribing to mods. 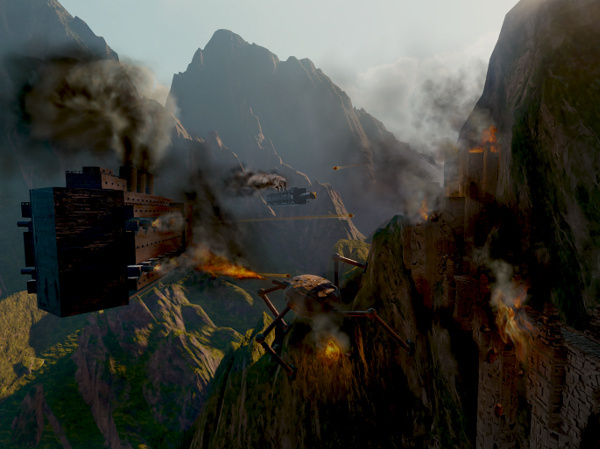 Ability for mods to supply AI airship designs. Better zoomed-out drawing support for crew. Making boarder pathing more flexible to deal with different jump and grapple lengths.